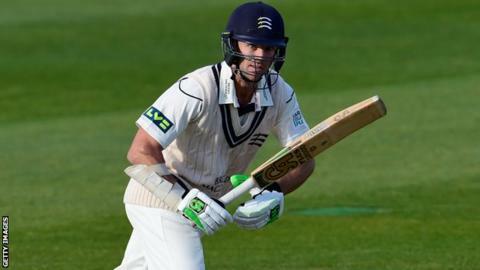 Middlesex have announced all-rounder James Franklin will captain their Championship side when Adam Voges is on international duty with Australia. Former New Zealand international Franklin, 34, joined the club in February on an initial two-year deal. "James has plenty of experience," Middlesex managing director of cricket Angus Fraser said. "I believe his calm, measured persona will make the departure of Adam as seamless as we can possibly make it." Batsman Voges will depart Lord's in mid-May and will miss most of the Championship season, as Australia tour the West Indies and then England. Franklin will captain the north London club until at least the end of August, when Voges or Australia team-mate Chris Rogers will be available to play in Middlesex's final three County Championship matches following the end of the Ashes. Nick Compton, who expressed an interest in replacing Voges as skipper, will be vice-captain while he is away. Franklin, who played 31 Tests, 110 one-day internationals and 38 Twenty20 matches for New Zealand, has captained Wellington during the last three English winters. The Wellington-born left-hander will also captain Middlesex in two T20 Blast matches for which Eoin Morgan, their limited-overs captain, is unavailable.